It was announced on April 20th, 2016 that Ancient of Lore would receive a nerf. Card draw reduced to 1 card, down from 2. Drawing cards is powerful in Hearthstone, and Ancient of Lore easily found its way into nearly every popular Druid deck. We’d like Druid players to feel that other cards can compete with Ancient of Lore, so we’ve reduced the number of cards drawn from 2 to 1. Choose One - Draw a card; or Restore 5 Health. Go ahead, carve your initials in him. 7 mana 5/5... Hmm.. Could had been a 5/7 at least. I'm commenting on this card days after Rise of Shadows released, and Druid has the theme of healing life to get huge swing effects, and I've seen this card pop up from time to time on streams. I have no idea how prevalent lifegain druid will be (my guess is not very), so I'm just kind of looking at this card from the perspective of looking back. It always seemed weird to me that Blizzard never went back to look at the card, especially since druid has had some outrageous card draw effects in the last year. Power creep has come a long a way (thanks Ultimate Infestation). Ever since Blizzard decided to un-nerf molten giant and move it to the hall of fame, I've always wondered if they'd do the same for this card, since they sort of fall under the same parameters: once tier 1 cards that were nerfed a little too awkwardly, and not enough to see play. At least with molten giant they let it be competitive in wild, and giant does see play. Which kind of brings me to Rise of Shadows. If lifegain druid eventually does become a tier 1 deck, I'm sure that the deck would be insane with an un-nerfed ancient of lore. And then it would lead us to probably agree that it at least needs a different change. Summon a 5/5 "Gain 5 Armor Or Draw 2 Cards Or Heal 8"
Compare this unnerfed version to the new OP spell//Infestation. Why? Blizzard Why? Why printed that op spell instead of unnerfing this??? "Drawing cards is powerful in Hearthstone, and Ancient of Lore easily found its way into nearly every popular Druid deck. We’d like Druid players to feel that other cards can compete with Ancient of Lore, so we’ve reduced the number of cards drawn from 2 to 1." right?? You said drawing card is to powerful in HS?? and What've you done with the infestation?? Is this some kind of contrast or something? by increasing 3 mana you draw additional 4 card? ?and 5 armors(Most like heal 5 compared to Ancient of lore but better than healing)???? and you get both effect without using Fandral synegy. This is so ridiculous. I remember when I used to have this card in golden. It just looks so nice... Its a shame I had to disenchant it after the nerf. I wish they would add this card and Keeper of the Grove to the Hall of Fame. Ah my beloved Ancient of Lore i will always keep you in my collection. In order to understand how good was this card pre nerf i have to explain/tell few things. First off druid is class that has the best class minions and is absolutely reliant on them because of not great board clears and proper hard removals. It used to draw 2 cards instead of 1. Card draw mechanic is most of the time tempo lose, however getting a 5/5 body while drawing 2 cards lets you keep up on the board and not lose too much tempo. Healing on this one is solid but not as relevant (it was used as much as 10/5 on Ancient of War). Now that it draws only 1 card it is just weak. 6 mana along with this would be rightful. It was strong in Force of Nature + Savage Roar for obvious reason, however FoN is nerfed. The nerf on this one makes no sense to me and you should also take in consideration that this is epic rarity card also. 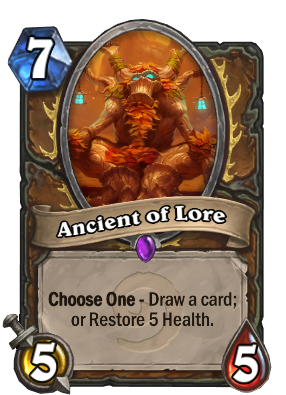 Epic Ancient of Lore- 7 Mana 5/5 with alternative of 5 Heal. Blizzard's math. Make it 6. Agreed. Now Azure Drake is light years better than Ancient of Lore. For 2 mana you get a +1/+1 stat boost *wow*. The fact that Ancient of Lore is a class card is even more sad. To the ground! Will never see competitive play again i wager. 2 card draw was too much service. Arcane Intellect is 2x draw but that spell only provides draw others are nothing (except, good effect is Mana Wyrm buff) actual card compression is only 1 card. Old Ancient of Lore is 5/5 body and draw 2 card result is 3 card compression that's too crazy. I remember when I started playing hearthstone, this card was the first Golden Epic I opened in a pack. That made me play druid 'til I have it golden. I loved its effect so much and I only had 1 copy that I would bounce it with Young Brewmaster to either draw 2 cards or heal for 5. May you still be viable again. I think a better change would've been Choose one; Discover a druid card OR heal 7, really a missed opportunity to implement the discover mechanic, which fits so well with the flavour of the card (It being a tree of knowledge). With the keeper nerf as well, It would've made this card somewhat playable, as you can discover a keeper instead of having one in your deck. This is clearly an over nerf. It should cost 6 or have better stats to keep it at fair value.